Here is another Valentine’s Day idea to do a for a friend or lover. 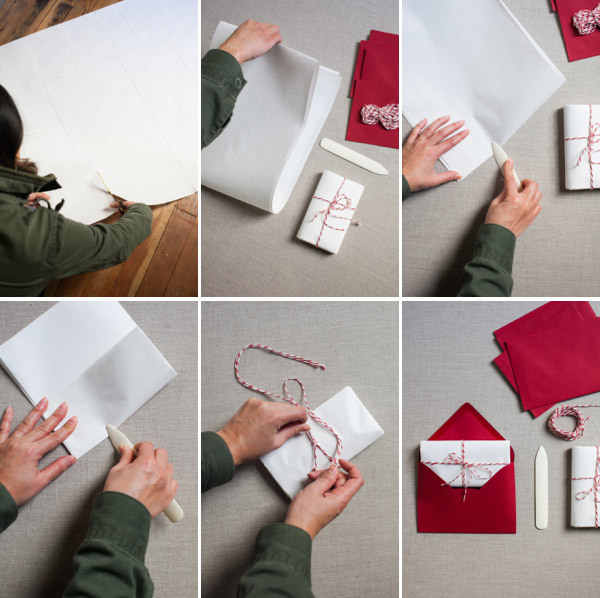 It is easy and cheap and all you need is a roll of white paper. (On a sidenote: we make it a family policy to always keep a cheap roll of white butcher paper around for art projects etc. My mom always kept one around when I was a kid and I remember it was my favorite thing.) For this project you fold up these big letters and then send one every day until your message is spelled out loud and clear. Happy Valentine’s Day! Step 1: Trace out a giant letter on the white paper and cut it out. 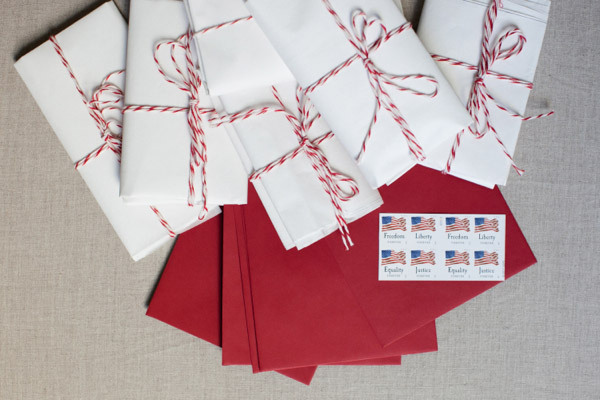 Step 3: When it is small enough to fit in an envelope, tie it up and put it in the envelope. Address, Stamp, and Send. What a cute idea! This would be great to send to grandparents too. You could even send the photos if you were trying to pull something together last minute! Love it! Such a cute and personal idea, love it! This is the most adorable idea I’ve seen all year! I love it! You could even make a poster of this…super cute! Jordan, this is so cute and it totally just gave me a flashback to something similar I did in college, well, similar in spirit, at least:) I had a boyfriend that was away for a swim meet and while he was gone I wrote out a love letter in permanent marker on a plain white sheet, got his roommate to let me in and made up his bed with the new sheet. Then when he got home he got to pull back the covers and discover a HUGE love letter:) I love big statements like this. Why say it small, when you can say it huge? This is so cute! Really unique take on a valentine’s card! I love the idea! It’s funny and it’s unexpected! I’m a teacher at junior high school and I think it could make a nice idea for a lesson – where each student/pair of students will get an envelope with a letter and they would make a word together from all the letters they find. I love love love this! So cute and so romantic. This is so sweet, I’m already planning to make the heart garland on yarn and may need to pick up more supplies for these! that is very cute! love it we just may try doing it! This is so cute. 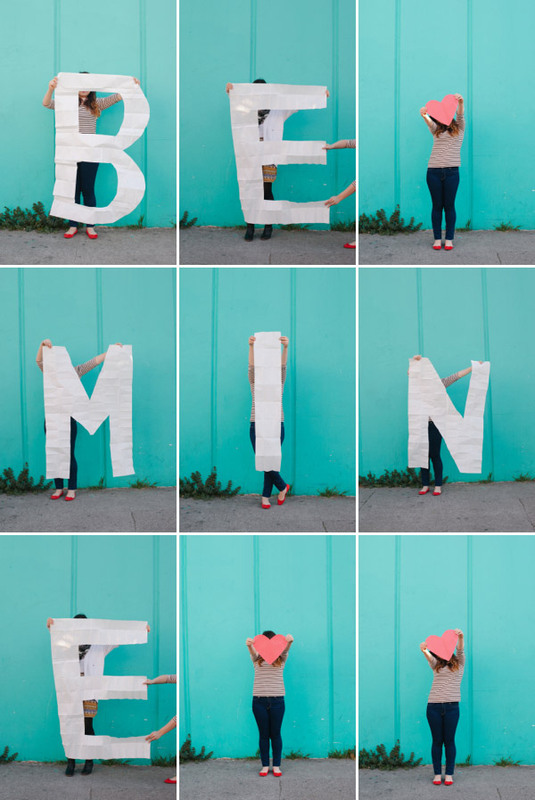 It just gave me the idea to make a photo project of me holding up letters for my boyfriend! Bah. love it. What a great idea for a Valentine’s gift! My husband would surely love this. It indeed helped me create something as awesome as this. Where can I find a roll of white paper? Also I can’t find fun twine, like the red & white striped…Where can I look, other than online? Super adorable idea… Another twist, If you have children and wanted to send a message to Grandparents or a spouse (on their b-day or father’s day), have kids dress up in different brightly colored outfits and hold poster board size letters… With their cute faces showing of course! This not only marks the special occasion, but also the “age/time stamp” of your children too! Grandparents, out of town god parents, etc love this. My twist is a Photo shoot… Send the 5×7 photo or email the photo to the person!